We’ve made it our mission to get intricate with most of the powerful and interesting tweaks that land on Cydia. Some of them may not be to our tastes, and some of them may not offer the functionality that we would necessarily make use of, but each user is different and the old saying of "one man’s trash is another man’s treasure" definitely springs to mind when talking about jailbreak tweaks. We have also made it our mission to stay away from jailbreak orientated themes unless they are truly exceptional and make Apple’s iOS a genuinely more attractive and elegant place to be. I guess that must mean that the Carla theme for jailbroken iOS devices is one of those stand out creations that makes the grade. Cydia is inundated with new theme submissions pretty much every hour of every day. The list of refreshed packages seem almost endless every time we launch Cydia to see what’s new. It’s for that reason that it’s generally a good idea for us to skip themes in majority. That is unless one immediately stands out and grabs us. That has been the case in the past with the Ayecon theme and it is certainly the case with the extremely detailed Carla theme for iOS. Carla is available for the iPhone and iPad as two separate purchases, which granted, is something that could make some people angry, but when you look at the level of detail in the icons and user interface elements, it becomes apparent how much work has gone into this package. The app icons that have been included with the theme bring a new lease of life to previously bland app icons that we have been used to looking at for the last few years. As with most good themes, Carla also includes an app icon mask for those individual icons that haven’t been themed. 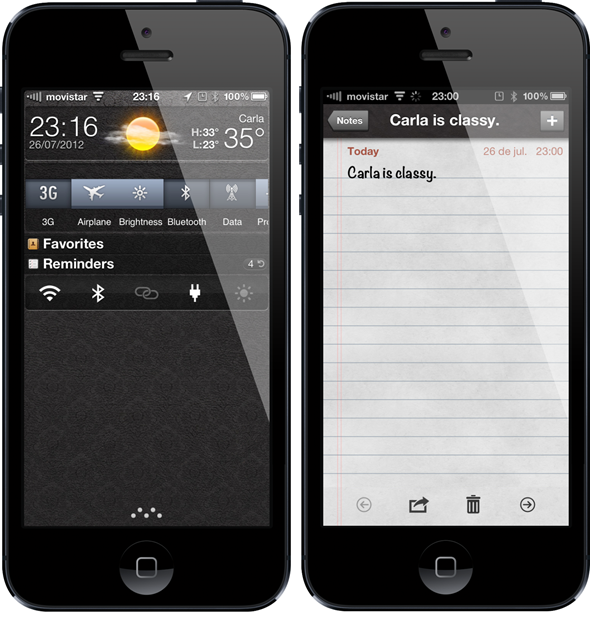 The additional pleasure of the Carla theme comes from the added extras that are attached and activated through WinterBoard. Lock Screen setups for the iPhone 5 and iPhone 4 form factors are both available. The creator has also included a number of different lock screen setups with a fantastic looking widget that can be ran alongside the installation. A great theme that is backed up with a fantastic level of detail. 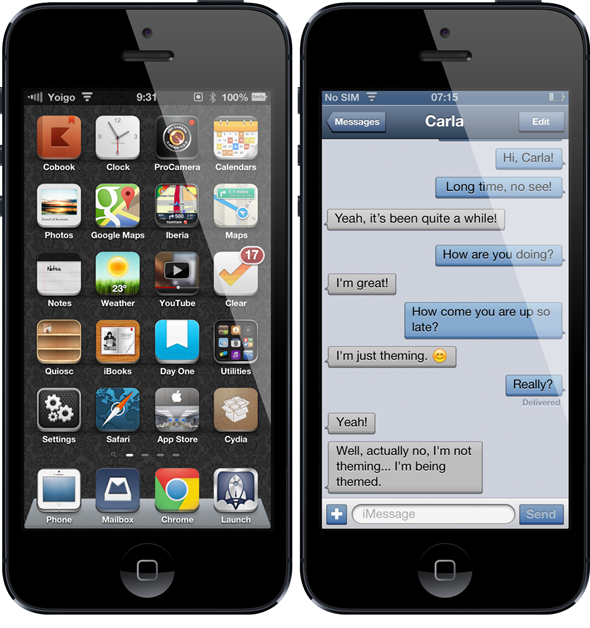 Carla can be downloaded from Cydia or Theme It, and is available as separate downloads for iPhone and iPad for a price of $1.99 each. Follow our Twitter and Facebook pages. If you’re already following us, then great! Share this post with your Twitter followers using this link. You’ll also need to add a comment on this story via Facebook, which you can do by following this link. That’s it, you’ll have entered the giveaway! Sit tight, and keep your fingers crossed – it could be you! We’ll be announcing the lucky winners at 11PM Pacific Time on 30th March. You all will be contacted by the developers of Carla theme soon. Let us know when you have received your free giveaway!